United Way Campaign Winners Announced! UE’s United Way campaign has ended, and the winners have been announced. Make sure you congratulate your coworkers when you see them today! Even though the campaign is over, your donation can still make a difference, and we are glad to accept it. Just bring your pledge card to the Office of Human Resources! If you have any questions, feel free to contact the office at ext. 2943. A big thanks to everyone who donated and who will donate! Your gift makes a difference. All Harlaxton former students and faculty are invited to join the Harlaxton Society in celebrating Gregory Gregory this Thursday, October 15, between 7:00 and 9:00 p.m. at Ri Ra Irish Pub. Register online to let us know you will attend at www.uealumnionline.com/ggevansville2015. Questions? Contact alumni@evansville.edu or extension 2586. The Jostens representative will be at the UE Bookstore on Thursday, October 15 from 11:00 a.m. - 2:00 p.m. for anyone interested in purchasing a class ring. The rep will have samples of rings and will provide you with all the options that are available. There will also some special pricing on some rings. Stop by and browse, there's no obligation to purchase. Faculty looking to purchase their own regalia are reminded that the Oak Hall representative will be at the UE Bookstore on Thursday, October 15 from 11:00 a.m. - 2:00 p.m. All orders placed on this day will receive 20% off the regular price. The rep will have samples of fabrics and pricing available for all your needs. The rep can also take accurate measurements for the garments you want. If you're thinking about purchasing, this is the event to check out. Harlaxton Professor Edward Bujak to speak at UE: All are Welcome! Don't miss the following opportunities on Thursday, October 15, to see Harlaxton professor Edward Bujak. Book signing in the UE Bookstore - 2:30 p.m., Lecture - "Harlaxton's First Global Citizens: The Officers and Gentlemen of the Royal Flying Corps" Vectren Lecture Hall of Koch Center - 4 p.m., Lecture "Life in the Grand Manor: 150 Years of Study Abroad" - 6 p.m., and Gregory Gregory Day at Ri Ra Irish Pub - 7 - 9 p.m.
LEAD Forward, a new group sponsored by the School of Business, is partnering with Uncharted International to hold a drive for a variety of goods they need. We are reaching out to everyone on campus to help donate and make a difference in the lives of these children! Some of these goods include: toiletries, new flip-flops, hats, new/gently worn clothing, volleyballs/soccer balls, vitamins and Tylenol/Ibuprofen. Collection will be TOMORROW from 10:30 am - 1:00 pm in Ridgway University Center by the information desk. Interested or have questions? Contact Marks Cannon (mc281), Hassan Taki eddin (ht61), or Kerilynn Pitocco (kp158) for further information. Please join the students of the Creative Writing Department at 4:00 pm on Friday, October 16, in the back room of The Slice for readings of poetry, fiction, and nonfiction. This month's reading will feature Rachel Moore, William Capella, and Sarah Butler. Hope to see you there! Nearly 50 employers are registered for Health Careers Fair 2015. Come to the Student Fitness Center next Tuesday, October 20, from 11:00 am to 2:00 pm to meet employers who are interested in you! All students, freshmen through seniors, who are considering a health-related career should attend. See registered employers in JobLink (https://evansville-csm.symplicity.com/). Also, pre-register for the event in JobLink to allow employers to view your resume early! "How to Make Your Business Dream a Reality"
Students are invited to attend a presentation and Q&A session by UE African-American Alumni entrepreneurs, titled “How to Make Your Business Dream a Reality,” on Friday, October 16. The event is from 6:00 – 7:00 p.m., in Room 170 (Smythe Lecture Hall), Schroeder School of Business Building. The speakers will share resources, a sample business plan, stories and tips. All students interested in entrepreneurship are encouraged to attend this event. Register online at www.uealumnionline.com/UEAAAEntrepreneurs15, or contact Angela Williams, assistant director of Alumni and Parent Relations, at aw162@evansville.edu or 812-488-2586. Don't forget to register for Indiana Means Business Career Fair. Bus transportation provided from UE. Contact Career Development to reserve your seat. Time is running out to make your 2016 yearbook graduate portrait appointment. Call (812) 488–2846 or visit Student Publication today through Friday to schedule your time. You can also schedule your time by stopping by the yearbook table from 11 a.m. to 1 p.m. Thursday, Oct. 15 and Friday, Oct. 16 in Ridgway University Center lobby. Have questions? Call Student Publications at (812) 488–2846. It is fall and that means it is time for Make a Difference Day, an annual day of service which UE participates. The day is Saturday, October 24. To sign up for the event either as an individual or as a team, go to: http://volunteer.sinc-evansville.org/aam/corp/?key=1a4bc357efa39997e9902398ac6d9a66. We ask that you sign up by Oct. 19 at noon in order to guarantee a t-shirt for the event. You can sign up afterwards but no guarantee will be made to receive a shirt. There are over 250 volunteers needed for this event so please be generous with your time. Is your resume in need of an update before the Health Careers Fair on Tuesday? No time to wait for an appointment? No problem! The Career Advocates will be available in the Center for Career Development on Monday, October 19 from 9:00 a.m. to 5:00 p.m. No appointment necessary, just drop in for a 15 minute review! 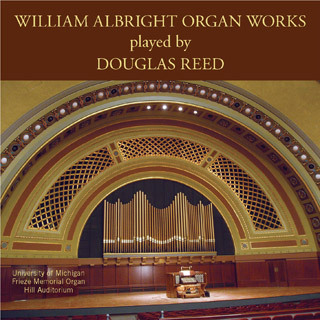 One of the most important American composers of organ music after 1950, William Albright (1944-1998) was born in Indiana and taught at the University of Michigan (1970-1998). He had a strong association with the University of Evansville which commissioned two major keyboard compositions from him: Four Fancies for harpsichord (1978, with the support of the Mesker Trust) and Symphony for organ (1984, with the support of the Indiana Arts Commission and the National Endowment for the Arts). The recording project, begun in 2005 with major support from the Friends of UE Music, includes Albright’s early organ works associated with the Frieze Memorial Organ: Juba (1965), Pneuma (1966), Organbook (1967) and Organbook II (1970-71). A later work, De Spiritum (1988), calling for assistant organists and percussionists, provided opportunities for University of Evansville music majors Zachary Guenzel, Michael Kuhr, and Timothy Weisman to participate in the project. UE’s Francile MacDonald McGary portative organ, a gift of the McGary family of Newburgh, IN, was also used in the De Spiritum recording. In addition to the FUEM grant, the project was supported by University of Michigan professors William Bolcom and Marilyn Mason; the University of Michigan School of Music, Theatre, and Dance; and the University of Evansville Department of Music. Parkison's Manuscript Appears in "Curriculum and Teaching Dialogue"
Paul Parkison, chair of the School of Education, has a manuscript published in "Curriculum and Teaching Dialogue, volume 17 (2) entitled "Catharsis in Education: Rationalizing and Reconciling." Examining education policy, specifically policy related to standards, testing and accountability, from a critical perspective reveals the dominance of the neoliberal perspective. The impacts of individual motivators on the educational system limit the democratic curriculum development process. “Feel good” moments for policy makers lead to stifling policies for teachers and students. Utilizing a qualitative discourse analysis, the rationalization of contemporary education policies is deconstructed. Division 1 Assistant Professor of Biology Noah Gordon recently co-authored a study with Michelle Hellman (University of Nebraska) on the regulation of reproductive timing in female treefrogs. The paper, titled: "Dispersal Distance, Gonadal Steroid Levels and Body Condition in Gray Treefrogs (Hyla versicolor): Seasonal and Breeding Night Variation in Females," can be found in the Journal of Herpetology. The University of Evansville women's soccer team (3-9-2, 1-2-1 Missouri Valley Conference) utilized a 65th minute goal from junior midfielder Colleen Dierkes to claim a 1-0 road win Indiana State (5-9, 0-3 MVC). The victory is the first MVC win of the season for the Purple Aces and their first road result of the year. Despite a few opportunities, neither team was able to score in the opening half. UE’s senior goalkeeper Simone Busby made three first half saves for the Purple Aces. Evansville’s only shot on goal in the first half came from junior defender Emily Richardson in the 44th minute but her shot from the right wing was saved by Indiana State. UE snapped the scoreless draw in the 65th minute. Off a corner kick from Richardson, the ball curved inside the 18 yard box where it was headed by sophomore defender Olivia Shafer and senior forward Kayla Smith. The airborne ball then found Dierkes along the far side post for the goal. It was her second goal of the season and gave UE a 1-0 advantage. Down by a goal, Indiana State attempted three shots the rest of the way but were unable to place any on goal in the 1-0 Purple Aces win. The victory for UE snaps a five game winless stretch. This is also only the second win for the Purple Aces at Indiana State (2-1 win on Oct. 12, 2007). The goal by Dierkes was the third of her career. The assists from Shafer and Smith were both their first of the season. Busby ended the evening with four saves for her third shutout of the season and 23rd of her Purple Aces career. The Aces continue their three game roadtrip at Cincinnati (Oct. 18) and at Illinois State (Oct. 25). UE returns home to host Missouri State on Oct. 29. The University of Evansville Women’s Tennis team will send its representatives up to Purdue University in West Lafayette, IN on Thursday to compete in the ITA Regionals. Marina Moreno and Marine Darzyan will both compete in singles play for the Aces. The Aces will be represented by Darzyan and Doreen Crasta along with Moreno and Andjela Brguljan in doubles action. Moreno, the lone senior, received a direct entry into the main draw for singles play and will not know who she will be competing against until the conclusion of the qualifying draw. She is also most recently coming off a 5th place finish at the MVC Individual Championships when she secured a 2-6, 6-4, 10-7 victory over Maddie Johnson of Drake. Darzyan, a freshman, will compete in the qualifying draw and will face Hanna Sohn of Memphis in her first match. Darzyan is coming off a heartbreaking 2-6, 6-3, 10-8 loss against Elvira Lopez of Northern Iowa at the MVC Individual Championships giving her the 6th place finish at the event. Darzyan will also be competing in doubles with her partner, and fellow freshman, Doreen Crasta. The duo, like Moreno in singles play, will have to wait to see who they will compete against since they received a direct entry into the main doubles draw. Darzyan and Crasta are most recently coming off a 8-6 defeat against Alejandra de Lasa and Ashely Thai of Bradley at the MVC Individual Championships. The other doubles pair is Moreno and junior Andjela Brguljan. They will take on Claudia Yanes Garcia and Lidia Yanes Garcia of Austin Peay on Thursday morning in the qualifying draw. This will be the first doubles match that the pair has competed in together this fall.